Dan Brubeck, the drummer among Dave Brubeck’s five musician sons, took his own quartet into The Seasons Performance Hall in Yakima, Washington, last night. As did his band’s recent album, the concert paid tribute to his father and to his mother, Iola, who wrote memorable lyrics to a number of her husband’s melodies. 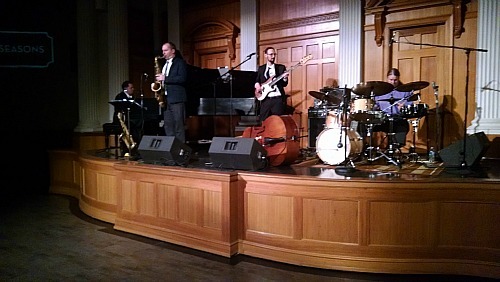 The quartet includes pianist Tony Foster, alto and tenor saxophonist Steve Kaldestad and bassist Adam Thomas. Introducing the band, I mentioned Iola’s answer when I asked her years ago what Danny was like as a little boy. I recalled that she gazed into the distance, silent for a few seconds, then smiled and said, “Hell on wheels.” The audience saw and heard evidence in his solos on “Blue Rondo a la Turk,” “Jazzanians,” and especially on “Take Five,” that he retains that aspect of his personality. Playing to a substantial holiday weekend audience, the quartet poured energy and ebullience into those and other up-tempo pieces. On quieter numbers, Brubeck was lyrical in the use of wire brushes. For a Rifftides review of the Dan Brubeck Quartet’s Live From The Cellar album, go here. The photo accompanying the review is highly disturbing. I see microphones on drums, bass amp, and sax; I’d bet more on piano as well. And, to go with them, stage monitors on the floor in front of saxophonist and bassist and alongside the drummer. I clearly recall your descriptions of The Seasons as a wonderful hall — why in God’s name would one need ANY microphones for a quartet with this instrumentation? And why would anyone use stage monitors that throw sound wildly into the room to muddy the direct sound of the instruments themselves? The ONLY good use for mics in a performance like this in a space like this is to record the performance, and to make announcements. It is a wonderful hall. I have mentioned that The Seasons’ natural acoustics are on a par with St. Nicholas Church in Prague and other great chamber music sites in Europe. I long ago lost my campaign to have The Seasons declared an amplification-free zone. The problem does not rest entirely with the management. Jazz musicians have become addicted to amps, speaker and monitors. Phil Woods, the great saxophonist who died recently, was an exception. The contracts for his quartet specified no amplification. Guitars were the first jazz instruments to be amplified, as early as 1930, making it possible to hear soloists like Charlie Christian and Django Reinhardt. The problem that concerns Jim Brown goes back at least sixty years to when someone first hooked up an acoustic bass to an amplifier. The bass got louder. To compensate, drummers played louder. Soon, electronic manipulation was increasing the volume of virtually every jazz instrument. The advent of rock and roll did not reverse the trend. When classical chamber groups play at The Seasons, they prove the point. Each instrument in a string quartet, piano trio or chamber orchestra is distinct and in balance with the others, gem-like in the hall’s splendid acoustics. The nine-foot Steinway concert grand piano certainly doesn’t require an electronic boost. My guess is that the chances of jazz groups recovering from their amplification dependency are slim or, more likely, none. Our commenter Mr. Brown, a superb audio engineer, may disagree. Even in Phil’s band, the bass was amplified. Halls that are perfect for a string quartet or piano trio may not be ideal for a jazz group due to excessive reverberation of the drums. Rather than compounding the problem with amplification it might be better to put a few baffles around the drums in addition to a rug underneath. However, I don’t recall ever seeing this tried outside of a recording studio. In a heavily amplified environment it can be very difficult for the musicians to hear each other without monitors. Monitor mix and placement become critical for both audibility and feedback resistance. With contemporary pop music, it’s often so loud that I doubt even the audience can hear the music. I don’t think they mind much, though, as long as the visuals are captivating and they can feel the bass thumping. The stage plot Dan Brubeck requires can be found here, and it’s exactly what you see in the photo. I assume that it reflects Brubeck’s experience playing in good halls and bad, and that The Seasons had to accommodate his requirements as part of its contract with him. His own website describes him as having been a highly energetic child–perhaps he’s always been amplified. Modern jazz players have become their own worst enemies with their wildly excessive use of amplification. Here are the slides for a class that I’ve taught for several years at the Stanford Jazz Workshop. As to the bass in Phil’s bands: there are good musical reasons to use an instrument amp for bass and electric guitar. First, amplifying the bass can allow the bassist much greater freedom of technique, and require less physical effort to play loud enough to blend with a band. Second, electric guitars have little or no sound on their own, but depend upon a pickup to capture and amplify vibration of the strings and body. Jim’s slide show is long, easy to understand and worth the time of anyone concerned with getting amplified sound right. Many thanks to him for sharing it with us. How nice to hear the good old St. Nicholas mentioned in this context! I live in Prague, and until very recently, about 50 metres down the street from that church. The acoustics at the Rudolfinum – where Sviatoslav Richter was first recorded by Deutsche Grammophon, and where I saw George Mraz play Moravian folk songs a couple of years ago – are even better. One reason that Hawkins and other early tenor players developed such big sounds is because they had to. I once played a wedding reception in a small hotel dining room for a bride who loved Puccini. I arranged “Nessun Dorma” and one other aria for voice with string quartet and hired an operatic tenor. While we were setting up, one of the hotel personnel came over and asked if we needed a mic for the singer. We all collapsed with laughter! I was more worried that the tenor would be breaking glasses in the next room.